I mentioned a few days ago that my kids are older but there's no shortage of kids at my house. I have an area in my guest bedroom that stores toys and learning activities. Gotta keep the young'uns entertained when they're over! Educational Insights, a manufacturer of educational toys and games, sent me the Hot Dots® Jr. Succeeding in School with Highlights™ Set for review. Based in SoCal, Educational Insights are a team of experts who pour their passion for inspiring kids into playful products packed with serious educational value. March into literacy with the Hot Dots® Jr. Succeeding in School with Highlights™ Set! Designed for children in kindergarten and first grade, this set reinforces the fundamentals and prepares kids for success. Included are 80 illustrated, double-sided cards with 160 lessons, an Activity Guide, and an Ollie—the Talking, Teaching Owl™ pen that provides silly sounds, lights, and encouraging feedback. Before using this set, parents should first read the Activity Guide. It demonstrates how to use the cards and pen, has a lesson guide on succeeding in school, and care instructions. 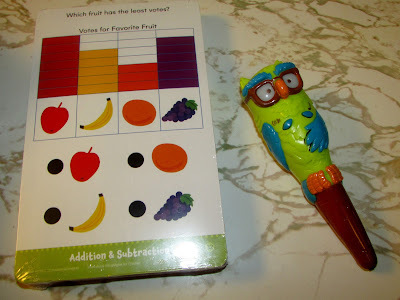 Ollie—the Talking, Teaching Owl™ pen requires 2 AAA batteries that are not included. The cards are grouped into different skills. How the cards work is that children use the pen to touch the dot next to a correct answer on a card. For instance, a child would use the pen to mark the word "nap" as a similar word to "sleep". If an answer is correct, Ollie's eyes will glow green and, if it's incorrect, Ollie's eyes will glow red. Ollie plays 17 phrases and sounds, and there's a volume control on the pen. Ollie should be held in a way that the pen is straight up and down on the answer dot. The pen should not be tilted in a writing position. Within the Activity Guide are enrichment activities, with instructions on how to work on other educational pursuits with your child. For example, there's a lesson on Fun with Straws and a lesson on Watching a Seed Change. This set is educational, interactive, and fun. One person will win a Hot Dots® Jr. Succeeding in School with Highlights™ Set. 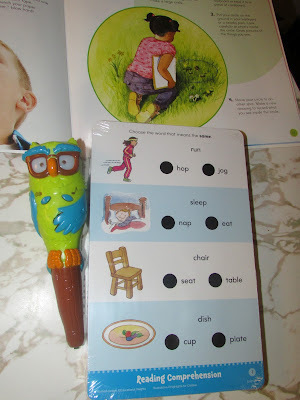 I would like to also get the Hot Dots® Jr. Let's Learn the Alphabet Interactive Books, 5-Book Set. My granddaughter would like that. I would love to get my kids the Nancy b science club microscope and science journal. I think the Nancy B’s Science Club® Crime Solver Scope and Forensic Activity Journal is fantastic. My older daughter would love it. She is all about NCIS stuff. I also really like their GeoSafari® Jr. Critter Habitat shown on their website! I like their Math Slam™. I think this would be a fun way to increase my grandson's math abilities. I also love the GeoSafari® Jr. Sneak & Peek Periscope from Educational Insights. I like the Geo Safari Jr Sneak and Peek from the Educational Insights. I want to try Shelby's Snack Shack game! My kids are obsessed with pancakes so I think they'd like the Pancake Pile-Up!™ Relay Game. I like the Design & drill robot. I also love Ike the Puppet on a Stick. I also like their MicroPro Elite™ 98-piece Microscope Set. I'd love to get the The Sneaky, Snacky Squirrel Game for our three year old daughter. She has just started to really like games, and this one looks fun and just at her level. I also really like the Magic Moves RainbowJam for my daughter, she would have so much fun with it. I like once upon a craft! I really like the science club microscope. My grandsons would love this. I like their playBrix. So easy to stack and light for the little ones. Love to win this for my boys! I like the Classroom Café Dining Play Set. Rhyme Out looks like a lot of fun! I like the Crowded Waters Game. I love all the Geo Safari products and so do my grandsons.. I also really like Nancy B's Science Club Stir-It-Up Chemistry Lab & Kitchen Experiments Journal. DESIGN & DRILL looks awesome! I like the cash register too. Like the drill and design robot. I like the Rhyme Out game. I like the Dino Construction Company™ Wrecker the T-Rex Skid Loader. the sunrise safari game looks like a lot of fun. Hot Dots® Jr. Pete the Cat® I Love Kindergarten! Set is one of my favorites. but id choose once upon a craft! fingers are crossed, good luck everybody! I also like the Multiplication Slam game. I think that Travel Blurt! looks fun. I think that the Kanoodle® Extreme looks cool! I really like the Classroom Café Dining Play Set! I liked the craft ideas, Once upon a craft Ugly Duckling. That looks great. I think it would keep them interested. GeoSafari® Jr. Science Utility Vehicle™ - always fun to watch utility vehicles doing their jobs! I really like the Playfoam Alphabet and shape set! My son would love that! I like the Once Upon A Craft. The geosafari jr subscope looks fun!